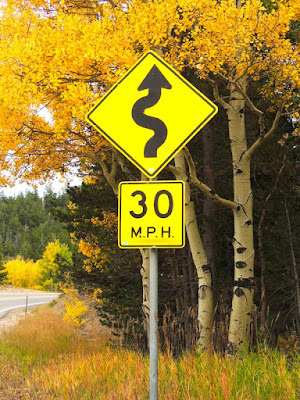 Come take a slow, meandering journey with me as I say hello to Yellow . . . 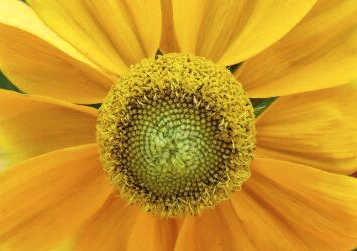 When I think of the color yellow, these words come to mind . . . happiness, optimism, creativity, energy, sunshine, warmth. 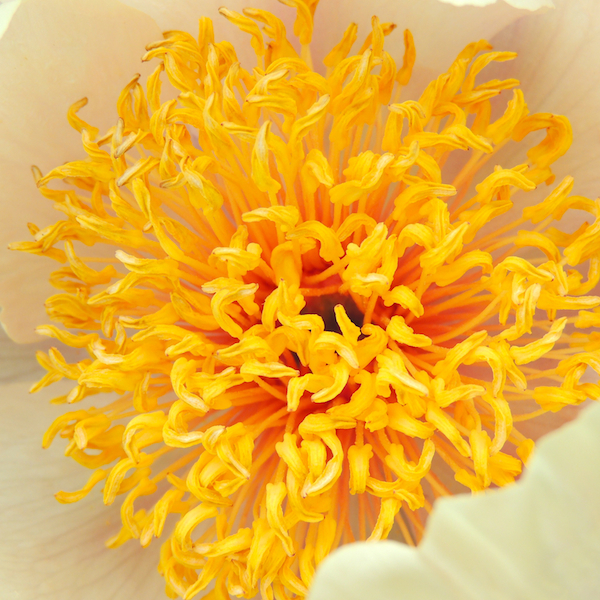 And names like amber, goldenrod, marigold, lemon, butter, corn, honey, mustard, straw, canary, saffron, citrine, yellow ochre. Yellow says spring, summer and fall to me. 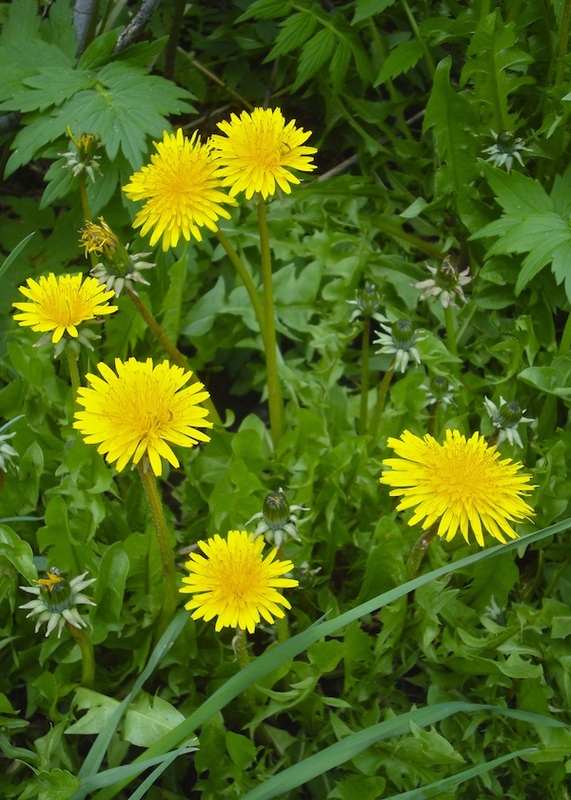 In the spring and summer, there are so many pretty yellow flowers. Daffodils, tulips, crocus, daisies, marigolds, asters, and of course the perennial favorite . . . dandelions. I have lots of those. haha. Besides the unwanted dandelions, I don't actually have yellow flowers in my own garden so I went looking elsewhere for these photos. Here are just a few. 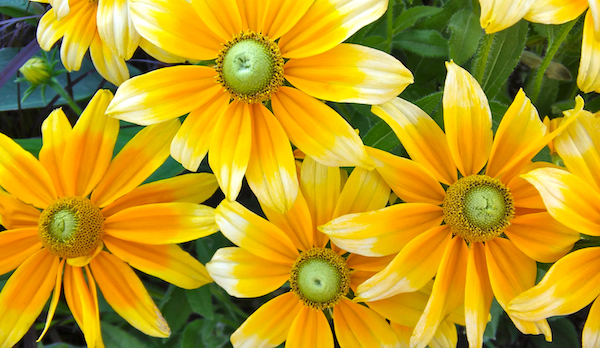 Lemon yellow to yellow-orange flowers . . .
Spring is also the time of Easter eggs and egg yolks . 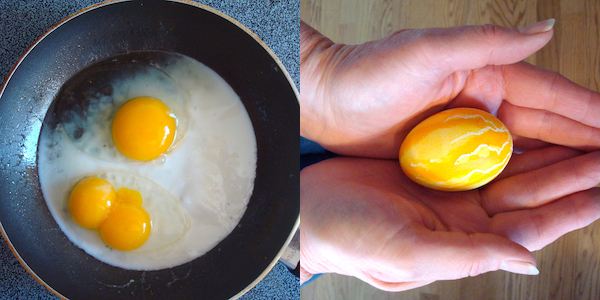 . . have you ever seen a double yolk? As I began my color search, I didn't think I had much yellow in my house. But the more I looked, the more I found. 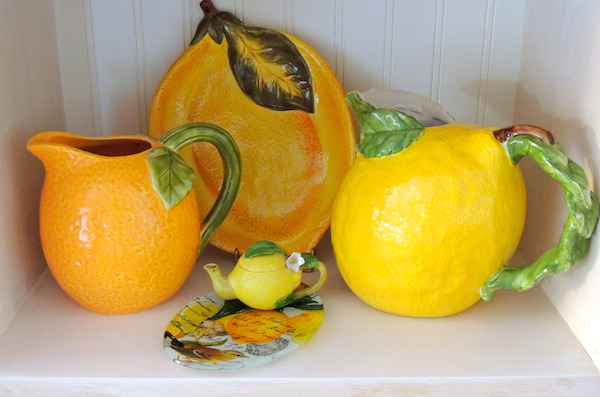 Lemon dishes make an appearance during the summer months. And there's this sweet yellow porcelain rose and china teacup that belonged to my mother. In the fall, yellow makes a stronger statement in my house as I bring out sunflower dishes and quilts . . 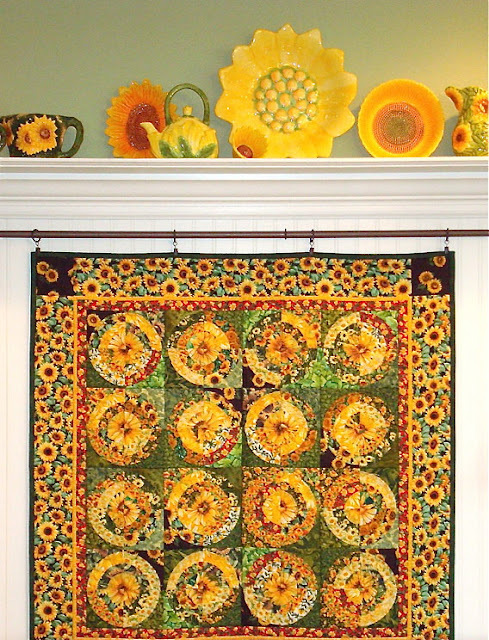 I have always heard quilters say a little yellow goes a long way and it's true in terms of yellow's ability to grab your attention. You really don't need a lot. But I happen to like the idea of yellow quilts. I have a mostly yellow Kaffe quilt that I use in the spring-summer months. I have pulled these yellows to make a baby quilt based on this idea. 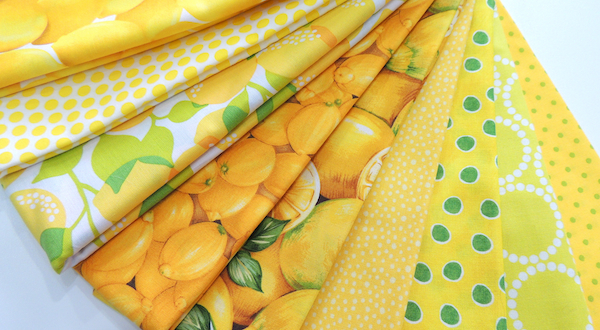 And then there's this lemony group for a new design. I didn't get to this summer. Maybe next. 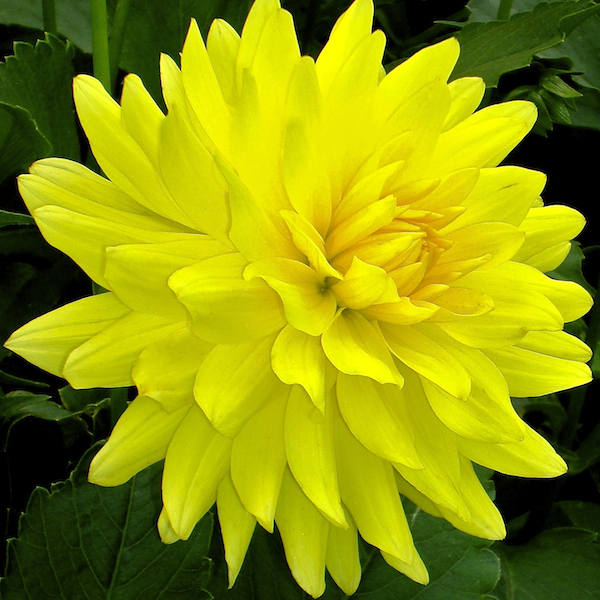 Yellow is considered to be the single color that gets our attention the quickest. In other words, people notice yellow first, especially in their peripheral vision. 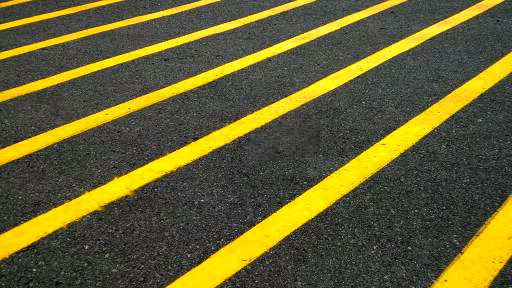 That's why yellow is the universal color of caution. 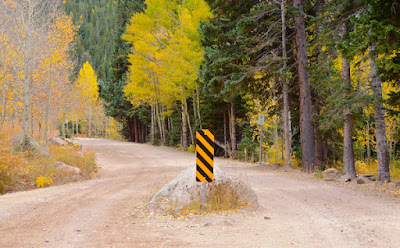 Road signs. Hazard lights. School buses. Taxis. We are supposed to notice these things. How about this funny hazard sign we saw over the weekend. Look closely and you'll see a large rock smack in the middle of the road. Wouldn't want to run into that. My strongest association with Yellow is most definitely fall. 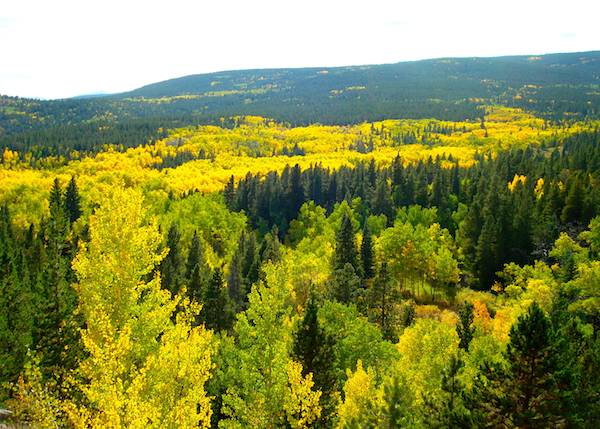 Here in Colorado, our falls are marked by rivers and islands of yellow aspens tucked amid the green pine of mountain hillsides. Plus there are yellow willows and cottonwoods clustered along the streambeds. In the high country, fall color has already arrived so we went leaf peeping the other day. 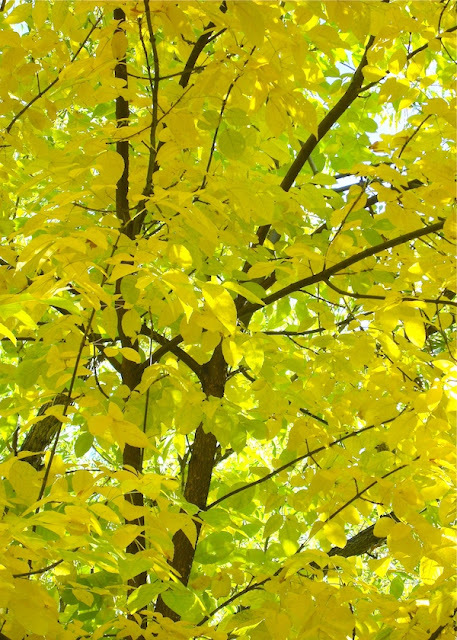 I love the bright yellow glow as sunlight filters through the leaves . . . 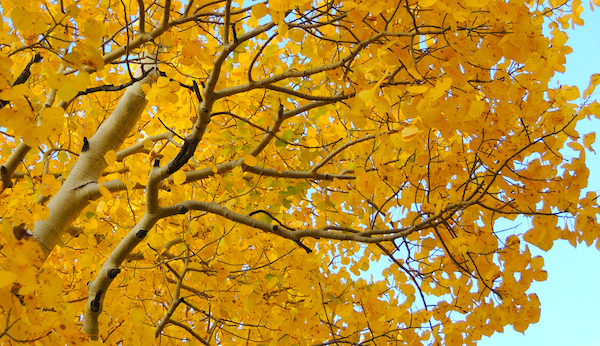 The silhouette of dark branches against the yellows that range from golden to chartreuse . . . 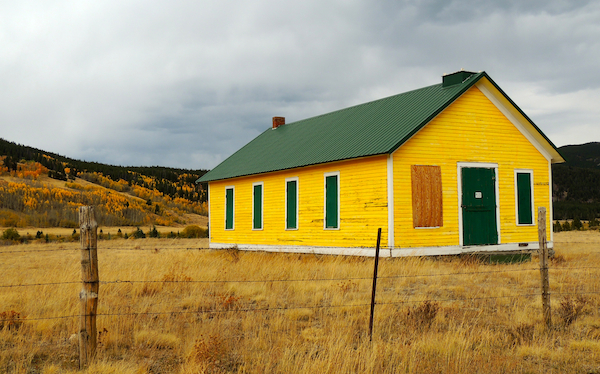 I found yellow in unexpected places like this bright lemon yellow building that looks like an old schoolhouse. It almost seemed fluorescent amidst the fall yellow landscape. Even the rocks in the stream had a golden hue. Hmmm . 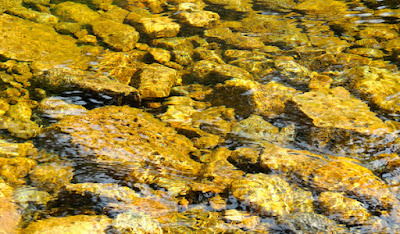 . . maybe there's still a little real gold to be found in them there hills. What child doesn't color the sun yellow? Bright yellow sunshine and soft yellow moonlight. 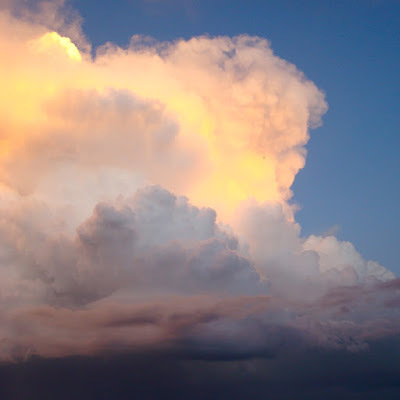 Even the clouds can have a pretty yellow glow . . .
Of course yellow also has it's negative connotations. Things like cowardice, sickness, even madness. But I much prefer the positive, happy side of yellow don't you? Since this post has more than covered my daughter's challenge to include a leaf photo for every color in my sereies, I'll leave you instead with this final image. Both my daughter and husband's use of yellow in their art. 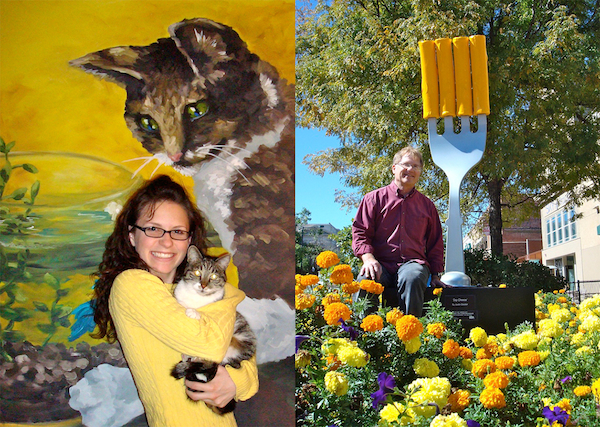 Emily's huge painting of our old kitty and Justin's "Say Cheese" sculpture which is currently in Napa CA. Emily has her own essay on yellow which you can find here. I challenge you to look around your home, your neighborhood, your work and really see the colors in your world. Go look for some Yellow in your life. Thanks for reading. Congratulations to the winner of the Good Neighbors charm pack sponsored by Connecting Threads. 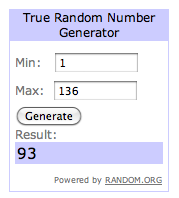 Buffy Skolnick had the winning number 93. She said . 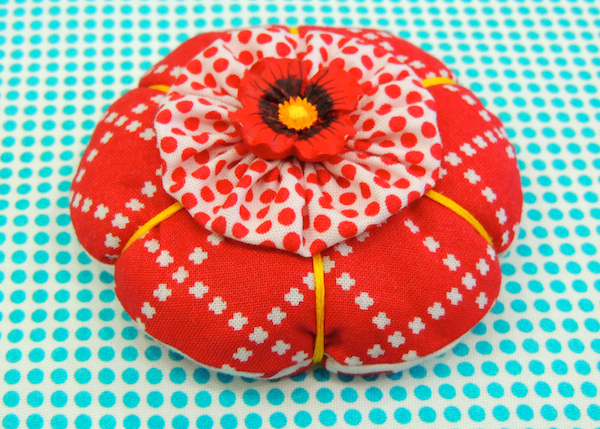 . .
"I have only made 1 pin cushion ever but I love it and have been using it for about a year. These posts have inspired me to make another with a little more skill that I have gained since the last one." Buffy, I hope this little charm pack will inspire you to make a new pin cushion or two or three or . . . I've sent you an email so please respond to that and I'll get your information forwarded to Connecting Threads. Thanks to all who left comments. It seems many of you have already made a pin cushion but an equal number have yet to try making one. 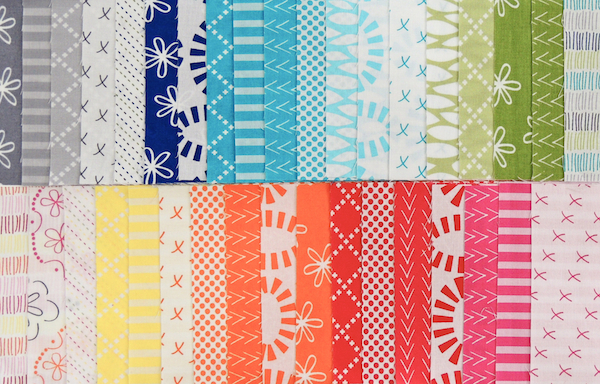 Good Neighbors is a great fabric line to get started with your first one or your 50th. Today is most certainly a finish it up day for me. My little quilt for the Kaffe Mini Swap is due to be shipped next week and I'm happy to say it's finished. Wahoo!!! It will be in the mail the first part of next week along with a few little extras. Be on the look out partner. Believe it or not but this is my first swap. I can't wait to see what I get. The block is based on my Drunkard's Path QAL concept. I just love how it looks in an alternative colorway. 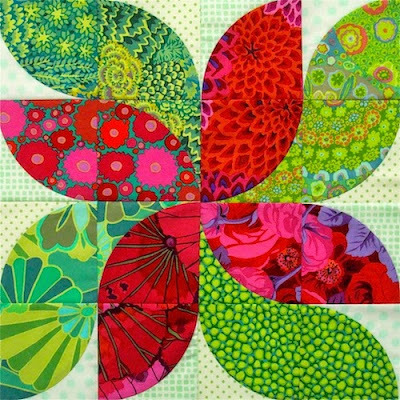 It's making me think a full sized quilt with different prints and background colors would be really fun. Hmmm . 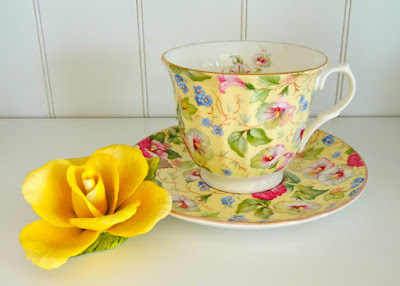 . . a new use for Kaffe and Amy Butler prints perhaps? 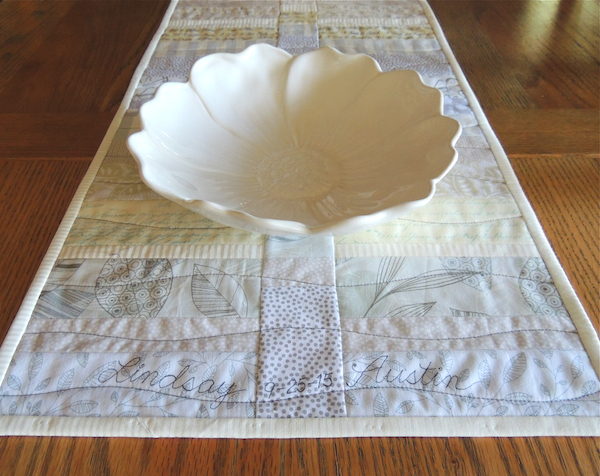 My other finish was this table runner made as a wedding present. The front is low volume creams and gray strips. The couple's gift registry is mostly neutrals. White dishes. 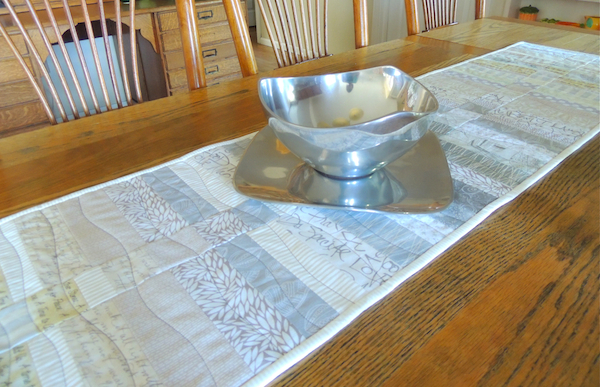 Silver serving pieces. A touch of wood. 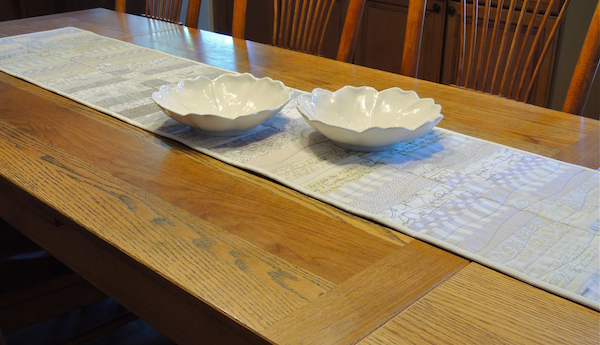 I thought the low volume would be a nice neutral to go with all their tableware. After piecing the strips, I trimmed a narrow section off one side and then inserted it into the middle offsetting the strips a little to add movement. It finishes at about 14 inches. 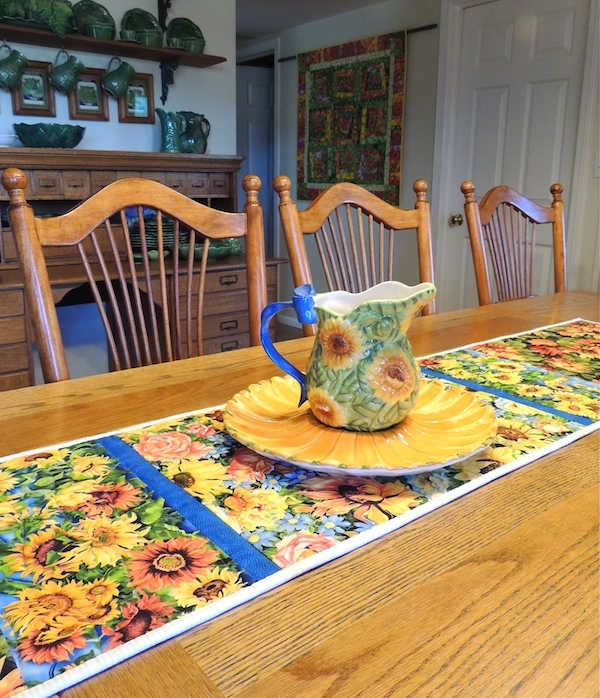 Not knowing the size of their table I went with a 72" length. Hopefully it will work well. I wanted to embroider their names and wedding date on it but realized after the fact that this is better done in the early stages. That takes planning ahead which I didn't do. Instead I simply wrote their names and date on the end of the runner. It's understated which is what I wanted so it's more like a subtle personal message. I opted for a double sided runner and used fall fabrics for the back to represent their fall wedding. So these are my Friday finishes. Linking up with Finish it Up Friday at CrazyMomQuilts. Just a reminder it's not too late to comment on on my Pin Cushion Party post for a chance to win a charm pack of Amanda Jean's fun new fabric line Good Neighbors. I'll choose a winner Sunday the 27th. Welcome to the Pin Cushion Party! Welcome to the Good Neighbors Pin Cushion Party. 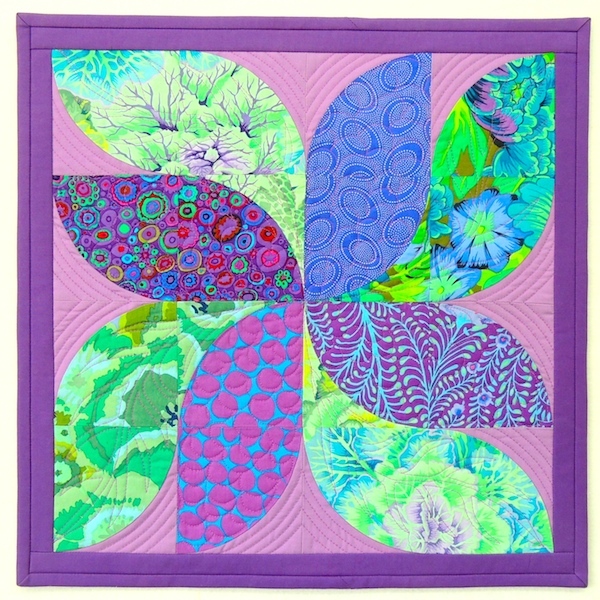 Good Neighbors is a new fabric line designed by Amanda Jean of Crazy Mom Quilts and sold exclusively by Connecting Threads. 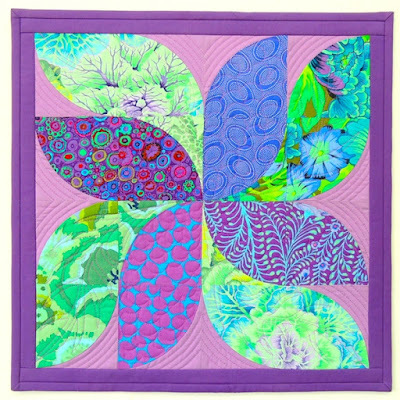 I don't remember how I first came across Amanda Jean's blog, but I do know Crazy Mom Quilts was one of the earliest blogs I read. 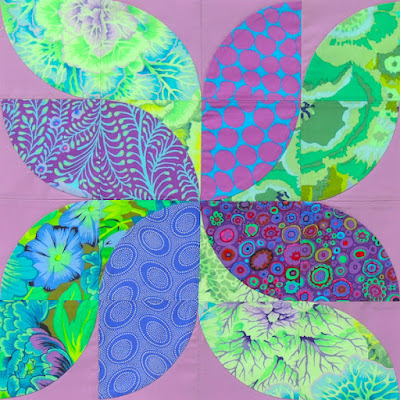 Perhaps it was the name that first got my attention but what really drew me in was Amanda Jean's colorful, happy quilting style along with her friendly blogging voice. She loves using scraps, making some of the best scrappy quilts I've seen. She also loves making pin cushions. Lots and lots and lots of pin cushions. 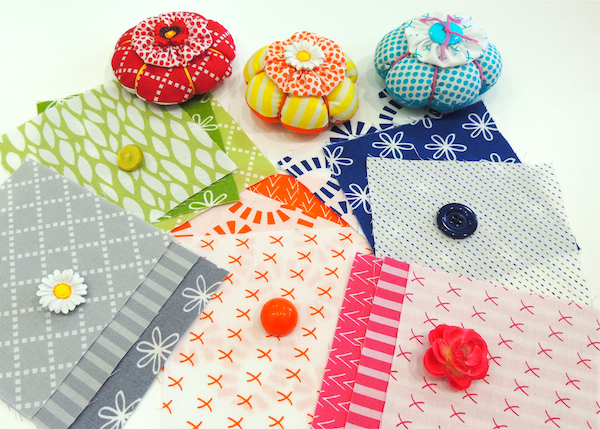 So a pin cushion party is the perfect way to introduce Amanda Jean's first fabric line. I'm delighted to take part and think you're going to love the fabrics. They are so colorful and happy . . . 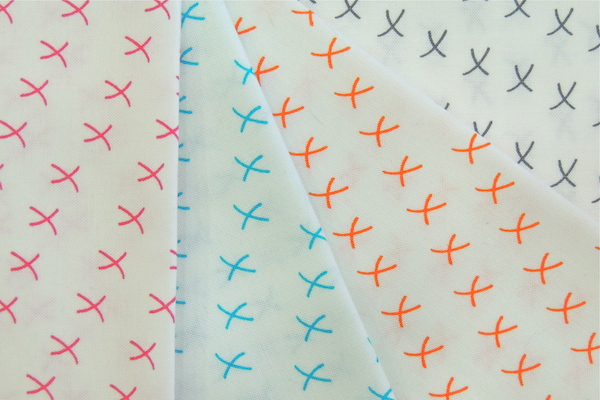 There are 36 prints in the collection ranging from gray, navy, bright blue, and green on the cool side to pink, red, orange, and a bit of yellow on the warm side. Every print has a touch of white. The line is nicely balanced between brights and low volume giving you room to play with value. I didn't realize until I started writing this post that my pin cushion is essentially the same as the one used in the Good Neighbor graphic at the top of the post. Call it a subconscious good connection to all these pretty fabrics. My little pin cushion uses three charm squares and there were simply so many wonderful color/print combinations that in the end I ended up making three. I do hope you'll check out Amanda Jean's Good Neighbors line at Connecting Threads. Below is my favorite print of the bunch called X's. I really love this one and will definitely be ordering more. My only wish is that there were even more colors like green and navy and red and . . . hint hint Connecting Threads . . . how about more colors? Pretty pretty please. See the whole line here at Connecting Threads. 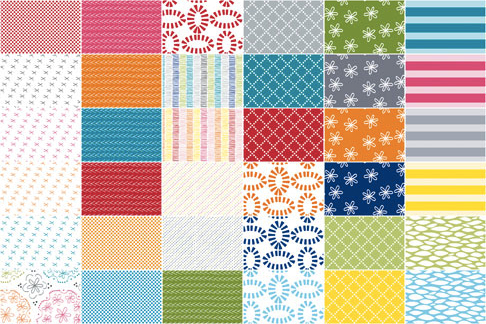 Not only can you purchase in yardage, but they also offer precuts in charm squares, 10" stacks, 2 1/2" strip sets and fat quarters. 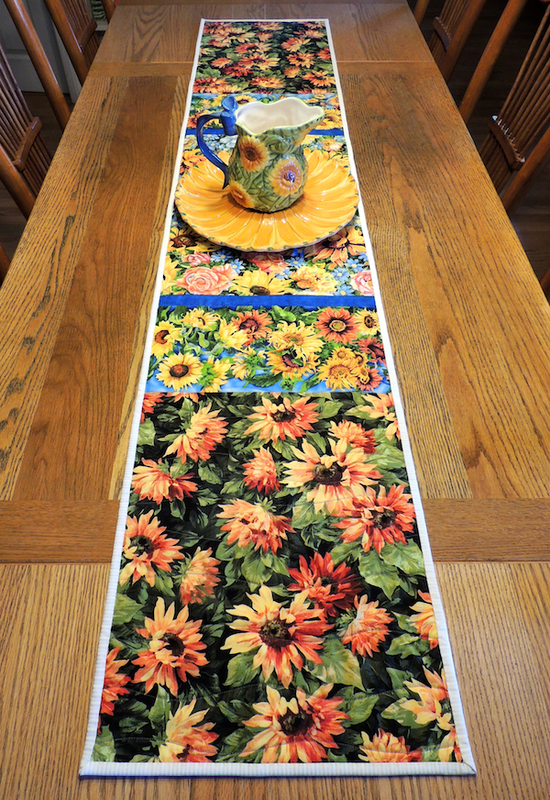 They even have a 108" wide backing of one of the prints. And there are several great patterns and kits as well. 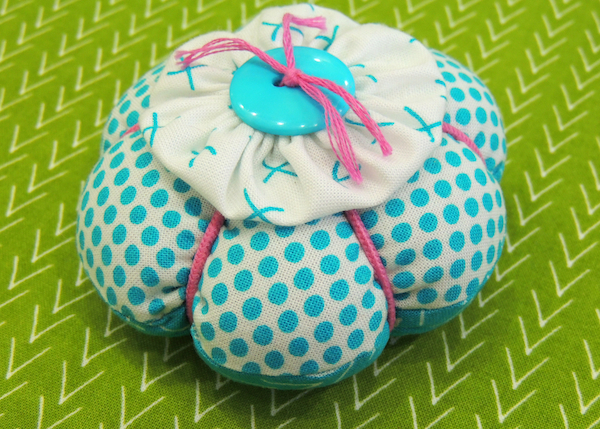 With one charm pack you could make a dozen pin cushions like mine. Keep them. Gift them. 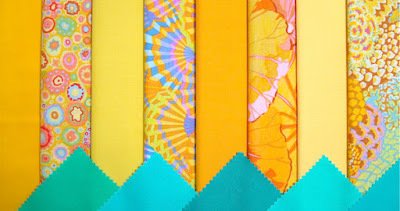 Use them as bright colorful eye candy in your sewing room. Fill up a bowl like Amanda Jean does. Here are links to the rest of the party posts. 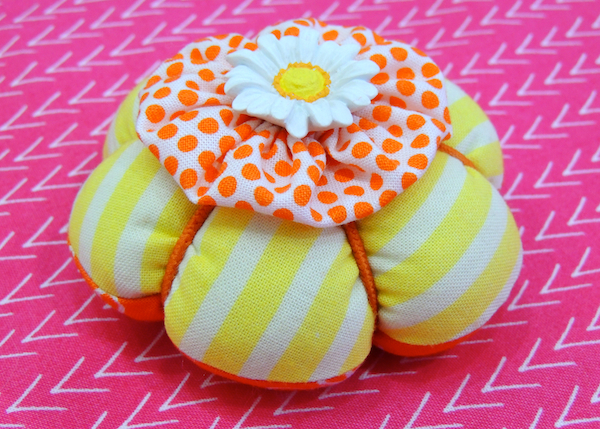 It's quite fun to see what type of pin cushions everyone has made. Plus each blog is giving away a charm pack of Good Neighbors so you have even more chances to win if you attend the party. Hop on over and have a look. Then go make a pin cushion. Thanks for reading. The giveaway is now closed. Oh my . . . summer has flown by and now here it is the middle of September. I'm still here. Still designing. Still sewing a little here and there. Looking forward to lots more sewing when the cooler weather settles in. Last week it was time to get my act together and make a pin cushion for the Pin Cushion Party blog hop over at Crazy Mom Quilts. This is Amanda Jean's first fabric line and it's so so fun. You'll be seeing my post and pin cushion on Saturday so stay tuned. 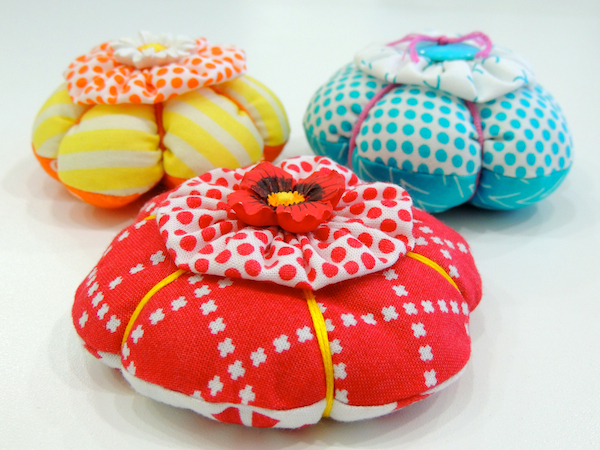 In the mean time, go check out some of the cute pin cushions everyone is making with her fabric line. The line is called Good Neighbors and is sold exclusively by Connecting Threads. 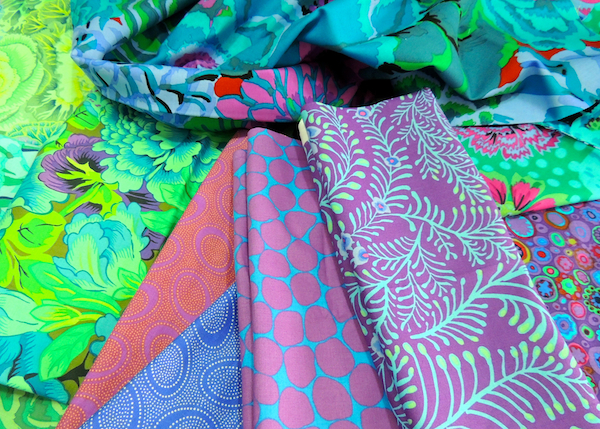 Here's a little sneak peek of some of the fabrics. This week it was on to getting my mini started for the Kaffe Mini Swap happening mostly on Facebook and Instagram. If you're a Kaffe lover then take a look at #kaffeminiswap on Intsagram for some inspiration. Lots of fun things going on there. Here's some of the Kaffe prints I'm using. The one in the lower right, called Ferns, is a new one in my stash. I'm just loving the purple and aquas together. Definitely need to get more of this one. This is what I have going on so far. I may add a little more . . . or not. We'll see. You might recognize the block. It's the same one I'm using for my Christmas quilt. You can see more about that on my blog under the Drunkard's Path QAL tab. My other major WIP of the month is my next color post. September is the month for Yellow so I'm seeing yellow everywhere. Each new month finds me searching my home and environment for the chosen color and as a result I have become even more aware of color. Try it. You really will see more. If you haven't seen my other color posts go here. So far I've done Purple, Green, Red and Blue. 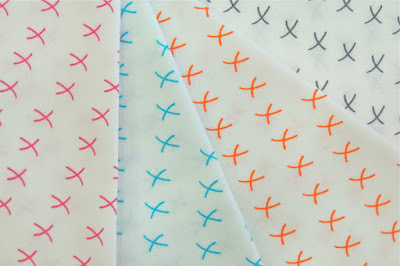 You can also see my daughter's color posts here on her blog. Her jewelry is all about color so she's having just as much fun as I am looking for color. See her jewelry at Emily Claire Studio.